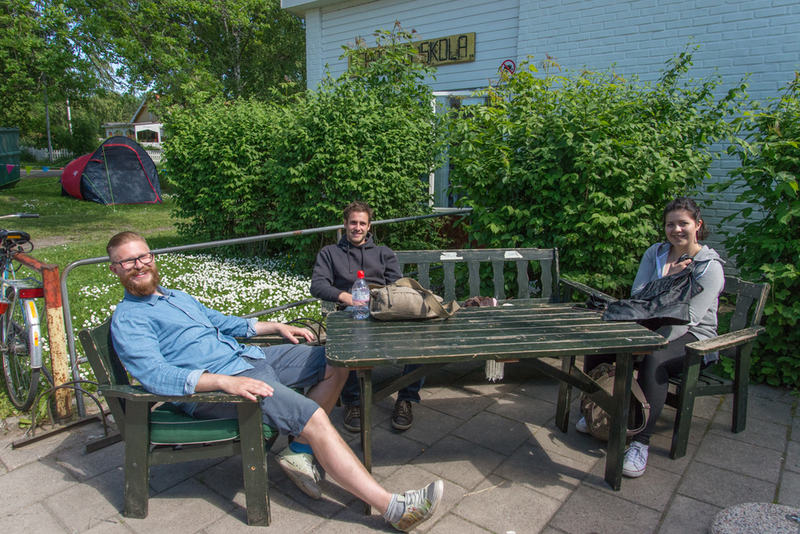 Note: If reading about the layout of a swing camp that you’ll like never go to does not appeal to you, then feel free to skip this post, and wait for Part Two: Herrang, the experience. If you are just skimming, I think that the Love Boats section below captures the spirit of the camp the best. On our third day in Stockholm, I bid goodbye to Harper, and took the subway to a bus station to catch the 639 bus to the 642 bus to Herrang. I met three Norwegian girls who were also going to Herrang for the first time, as well as a cheery Swede named Michael, who had come to Herrang for many years, as well as a few other dancers. Thus bus was already full when it pulled up, all seats were taken and luggage was piled in the aisle—more swing dancers had gotten on at an earlier stop. I managed to find a standing spot that barely fit me and my bag, and wedged by the rear door, I talked with Michael and the Norwegian girls for about 45 minutes trying to suppress my slight claustrophobia and subsequent anxiety, until some seats opened up and we were able to sit down for the rest of the ride—much more pleasant. I do feel bad for the poor souls that were just trying to take the bus like usual that day, probably completely confused why this normally quiet route was chock full of people and luggage. Herrang – What the hell is it? For those of you who have made it this far in the post and have no idea why I was going to Herrang, let me tell you: Herrang is a 5 week-long swing dance camp in Herrang, Sweden, and basically mecca for swing dancers from all over the world. It’s hard to describe Herrang, it’s one of those things that you have to experience, but it’s kind of like a cross between summer camp and college, if the soundtrack was from the 1930s and everyone knows how to dance to it. Herrang itself is a tiny little Swedish village, population of a couple hundred. The “downtown” consists of a food market, with a food stall outside that serves moose burgers, and another food stall that serves Thai food (there’s also no ATM in the town, so be sure to bring cash). But for five weeks in the summer, 500-1000 swing dancers takeover the area for dance camp. I liken it to Burning Man for swing dancers—essentially an entire functioning city that comes and goes over the span of a few short weeks. I had read a lot about Herrang on the website, and there’s a lot of information about the facilities, what you can expect, etc., but I had a hard time understanding how it all came together. So, let me lay it out here: Herrang’s takes over two sides of the main road just a few minutes walk from the one store of downtown. The east side of the road is the School Area, and here there are many one-story red wooden buildings (not unlike the setting for Wet Hot American Summer, I realized upon re-watching it). The cafeteria, called Heaven’s Kitchen Restaurant) serves breakfast and dinner with food that is really quite good. The “internet igloo” has a few spare laptops and wifi, for which you can buy an access code for the day or week. The Ice Cream Parlor (ICP) serves delicious lattes, coffee, sandwiches, cookies, banana bread, and—most excitingly—affogatos. It’s generally in the center of things, and its outdoor seating is a hangout spot for between classes. My friends from the bus! Michael, Jure, and Bettina. This is the first day before registration—everyone looks so well-rested. he ICP is in the same building as the gymnasium, which is stuffed full of bunk beds. I had the pleasure of staying here, in the company of 90 of my new closest friends (it’s a good thing that sleeping is not prioritized at Herrang, because the gym was not a conducive environment for it.) There are a few other places like the gym, where many people sleep in bunk beds set up in big open areas. There is also private or semi-private accommodation scattered about—an option I’ll go for next time, whenever that will be. Behind the gymnasium there’s the laundry house, the shower huts, and the bathrooms, with a row of sinks on the back. There are large white tents scattered among the red wooden buildings, with wooden dance floors installed inside, and this is where we had some of our classes. There’s also a building to get massages, a building with saunas (these were broken my week), and a make-up tent where anyone can get ready for the dances. Somewhere in this picture, there’s also the Russian Kitchen, which I never went to, but is an open kitchen that anyone can use to cook if they don’t want to be on the meal plan. When I asked what a Russian Kitchen was, I was told that it’s the kitchen that is always full of Russians. On the west side of the road there’s a smaller and slightly more centralized campus, including the main Herrang Dance Camp building, two stories tall, called Folkets Hus. Bar Bedlam on the right, the HDC bar and restaurant, where people can be found at all hours of the day and night. To the left is a room dedicated to Frankie Manning, one of the greatest swing dancers of all time and who was integral to the resurgence of the dance (he visited HDC many times before his death in 2009.) In fact, all of HDC is almost like a memorial to Frankie Manning. In the Frankie Library, you can sit at one of the small tables and drink one a Frankie Float (a root beer float). Through this Frankie room and down a short ramp is the Library, a small dance floor with a few couches for lounging on the edges, where each night a DJ would play more experimental music that people could dance to, as an alternative to the two other main dance floors going. I had some of my best dancing in the library, most notably on Funk Night and to Jungle Jazz, which is basically the music that plays in old loony toons. If you don’t go right to Bar Bedlam or left to the library, you can go straight back to the largest dance floor, one of the two main ones for the evening dances. Here there’s another Café Blue Moon, where I usually got lunch, and then a second dance floor, this one with a stage, where there are also the nightly meetings. There’s also the Prop Shop, basically a trailer with all sorts of dress-up and play stuff that you can borrow for any reason whatsoever, and the Lindy Hop Shop, an amazing store where they sell vintage clothing and dance shoes, with new stock coming in every day—a very dangerous place for me. I got a new pair of practice dance sneakers, as well as some vintage dresses, but after two trips there decided to cut myself off before it got too bad. All of the facilities are staffed by volunteers—you can volunteer for a free “party pass” for the week, which means access to the nightly dances but not the daytime classes. Behind Folkets Hus is a small lake that has a dock where, according to Herrang's website, you can "borrow on one of our hopefully still floating vessels," which about sums up the camp's dedication to their sea worthiness. a boat is sawed in half and pointing upwards, like Jaws. Inside is a little sitting area. There were three watercraft at this dock: two were rowboats (initially, though one disappeared by the end of the week) that sometimes had oars, and the other was an old bathtub, suspended between planks of wood and empty jugs, for buoyancy. I did actually see two people try to embark on this thing, but they only made it about 15 feet (impressive, considering they had nothing but a toy plastic golf club to row with,) before they got caught on the reeds and started to take on water. They abandoned ship and instead swam to the floating dock about 50 yards off shore. About a fifteen minute walk up the road is a marina and a small beach area, where you can swim in the freezing and murky Baltic, if you so desire (I only did once, on the hottest day.) There’s also some woods that you can hike through to get to some large, smooth, dark rocks right on the water, where my friend Paul and I went to one day and lay out in the sun like lizards. That about sums up the layout of HDC, it’s an impressive operation, made more so by the fact that it’s mostly volunteer-run. In the next post, I’ll talk about what it was like to actually live and dance here, but in short, it’s pretty much the most fun place I’ve ever been.